An immaculate and very lightly used example of the very popular Sun Odyssey 33i, enjoyable to sail and very comfortable with a light and airy interior, spacious aft cabin and a roomy shower and heads for a yacht of this size. After the first season, this yacht has seen very little use due to the owners other projects. 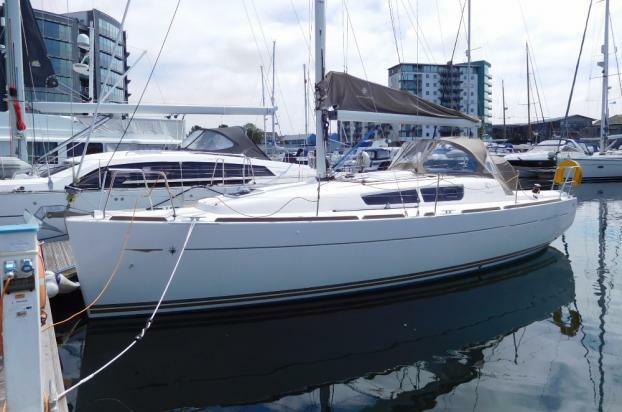 This is a great opportunity to acquire a well equipped and 'Low Mileage' cruising yacht. Yanmar 3YM20 20hp indirectly cooled diesel engine. 240v Shore power connection with shore cable. Forward cabin with double berth, side shelving, hanging locker to port, shelves and stowage lockers opposite. Bi-Fold doors to saloon. Saloon with settee berths each side of central table with wide leaves. Under berth stowage each side and storage lockers behind berths each side. forwards or table can be slid aft against bulkhead to be used facing aft. Pleated blinds to side windows and roof hatch blinds/mosquito nets. LCD TV on forward bulkhead. GRP Hull & Deck, designed by Marc Lombard and built by Jeanneau Yachts in 2012.